The festive season in the Spanish capital is saturated with Christmas cheer and that elusive holiday spirit. There’s nothing better than wandering through the light adorned streets with the hum of happy, chattering families and stores brimming with tempting treats. 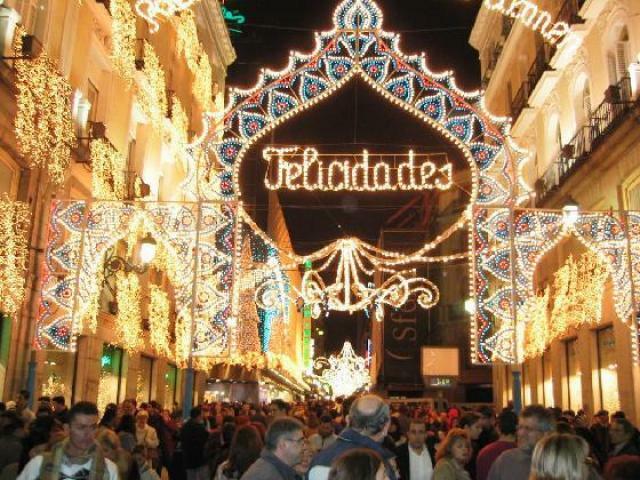 Here is a tiny taster of Christmas the Spanish way and what you should expect if you are planning to party with the Madrilenos over the winter season. Classic Christmas food in Spain is made up of hunks of delicious steaming meats, fresh fish dishes and generous sides but the festive frivolity really seeps in with the sweet treats. Spanish Christmas sweets are unparalleled pieces of sugary heaven. There is a plethora of syrupy delights, which include a variety of nougats, marzipans and crumbly, moreish things. No hamper is complete without dates (datiles), walnuts (nueces), turron (almond flavoured nougat) and mandarins (mandarinas). 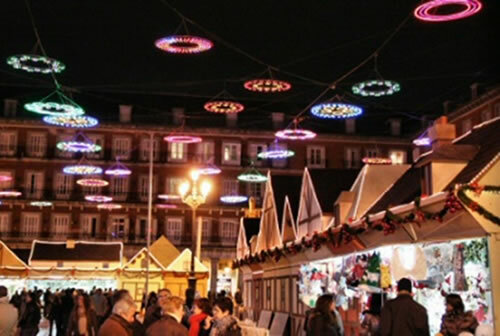 The main Christmas market each year in Madrid is in Plaza Mayor. It officially opens in the first week of December and the abundantly laden stalls sell all sorts of nibbles, drink, arts, crafts and really a whole host of delightful Christmas bits and bobs. If you are planning on a good old shopping binge while you are away, being surrounded by all the new markets and shops, you might want to consider getting some insurance. Don’t forget to compare travel insurance prices just like you would when on anything else while shopping. In Madrid, apparently, Christmas officially begins on December 15 and to celebrate this joyous occasion there is a magical show in Plaza de Oriente (Metro Opera) at 8pm, which shouldn’t be missed on account of its festive exuberance. For the past two years there has been an outdoor ice rink in the Retiro Park and the tradition is sure to continue. Set in the luscious gardens of the Parque del Buen Retiro, which is scattered with marble monuments, landscape lawns, stretching pathways and unusually beautiful buildings, is the huge ice skating rink. You will feel like you are ice-skating with royalty as the regal buildings and snow dusted trees over look the rink. If you are planning on paying this a visit it might again be a wise idea to purchase travel insurance to Europe for you and the family. Absolutely no one wants to be spending their hard saved holiday money on expensive hospital bills abroad. 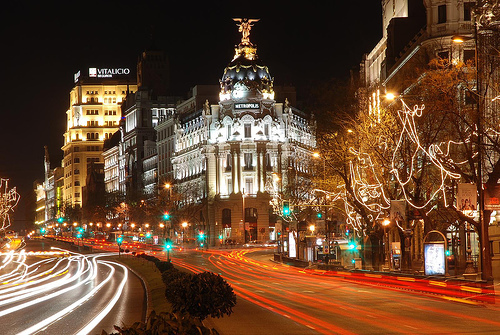 The whole of Madrid is generously blanketed in dazzling lights however, having said that, the most spectacular displays will be on Gran Via and of course the department stores in Sol, which always make a gargantuan effort with sparkles. Unfortunately not so popular in the UK, the nativity scenes, called Belenes, are carefully placed throughout the city and instil the very essence of Christmas into the streets. The town council's nativity scene will be in Plaza de la Villa, which is possibly one of the grander scenes. On Christmas Eve there is a wonderful animal parade in Retiro Park, which even the tiniest tots will enjoy and the atmosphere is utterly jovial. The Three Kings day is just as big as Christmas in Madrid and warrants special consideration. On the evening of January 5th, Noches de Reyes, thousands of children, parents and friends gather to watch the cabalgata (parade) where giant colourful floats, music and dancing light up the streets. Riders scatter handfuls of shiny sweets as they pass and the atmosphere is full of effervescent anticipation. The following day is the day of the kings and traditionally families group for hearty feasts and present giving.